Today is World Nutella Day! To celebrate, I made these yummy Peanut Butter Nutella Ritz Cookies. The regular Peanut Butter and Ritz Cookies are one of my favorite treats. My Mom usually gets some at Christmas from one of her students. That is really the only time I eat them. I am not sure why, but I never think to make them myself. I was brain storming about what to make for World Nutella Day, and I thought what about adding Nutella to the Peanut Butter Ritz Cookies. YUM! Sweet, Salty and Chocolatey all in one bite! Spread a dollop of peanut butter on half the Ritz crackers and some Nutella on the remaining half of the Ritz crackers. (Use as little or as much of each that you want) Sandwich the peanut butter and Nutella halves together. Melt the almond bark in the microwave, stirring every 30 seconds until it’s melted and smooth. Take a sandwich and drop it in the melted almond bark, turning over with a fork to coat. Remove sandwich from almond bark, tapping against bowl to remove excess coating. Place on wax paper to cool before serving - about 30 minutes or until the bark is set. Great job on the cookies Steph. Oh my do these little babies look GOOD! 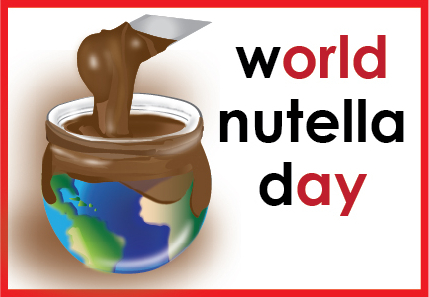 I had no idea it was world nutella day. What a great way to use it! Steph these are TOO CUTE and sound amazing!! Oh my gosh, these look FANTASTIC! These are just wicked cool. I like the combination of ingredients. Big, big fan of the salty sweet combo. Reminds me of the white chocolate oreos. Sound very good. Brilliant idea! I love these yummy sandwiches - they could only be improved by adding nutella. Can't wait to try this soon. So glad I came across you today. This sounds delicious. I don't think we have almond bark here in London- would white chocolate cake covering work (like white chocolate but melts and coats more easily)? Yes - That sounds like it is very similar to almond bark.